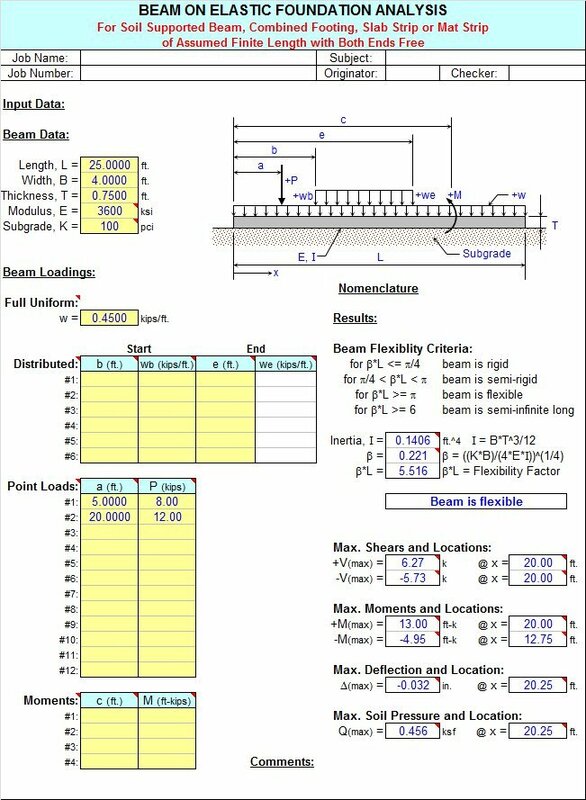 BOEF is a spreadsheet program written in MS-Excel for the purpose of analysis a finite length beam with free ends supported continuously on an elastic foundation. This program is ideally suited for analyzing a soil supported beam, a combined footing, or a strip of a slab or a mat. Specifically, the beam shear, moment, deflection, and soil bearing pressure are calculated for 100 equal beam segments, as well as the maximum values. Plots of both the shear, moment, and soil bearing pressure diagrams are produced, as well as a tabulation of the shear, moment, deflection, and bearing pressure for the beam. "Formulas for Stress and Strain" - Fifth Edition - by Raymond R. Roark and Warren C. Young, McGraw-Hill Book Company (1975), pages 128 to 146. Beam must be of constant cross section (E and I are constant for entire length, L). Elastic support medium (soil) has a constant modulus of subgrade, K, along entire length of beam. Applied loads are located in the center of the width, B, of the beam and act along a centroidal line of the beam-soil contact area. Bearing pressure is linearly proportional to the deflection, and varies as a function of subgrade modulus, K.
4. This program can handle up to twelve (12) concentrated (point) loads, a full uniformly distributed load with up to six (6) additional full or partial uniformly distributed loads, and up to four (4) externally applied moments. 5. Beam self-weight is NOT automatically included in the program analysis, but may be accounted for as a full uniformly distributed applied load. Beam self-weight will only affect the deflection and bearing pressure, and not the moment or shear. 6. This program will calculate the maximum positive and negative shears, the maximum positive and negative moments, the maximum negative deflection, and the maximum soil bearing pressure. 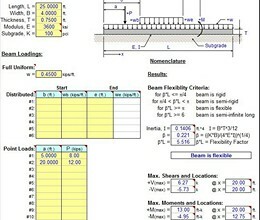 The calculated values for the maximum shears, maximum moments, deflection, and bearing pressure are determined from dividing the beam into 100 equal segments with 101 points, and including all of the point load and applied moment locations as well. 7. The user is given the ability to input four (4) specific locations from the left end of the beam to calculate the shear, moment, deflection, and bearing pressure. 8. The plots of the shear, moment, and bearing pressure diagrams as well as the displayed tabulation of shear, moment, deflection, and bearing pressure are based on the beam being divided up into 100 equal segments with 101 points. * BOEF download link provides freeware version of the software. BMREINF9 is a spreadsheet program written in MS-Excel for the purpose of analysis and code checking of steel members with various types of reinforcement configurations. This Steel Design App lets you determine the elastic stresses at the top and in the middle of a beam, given the forces on the beam based on the theory of Huber-Hencky. BOEF has been rated 5.0 out of 5 points. A total of 5 votes cast and 0 users reviewed the software.